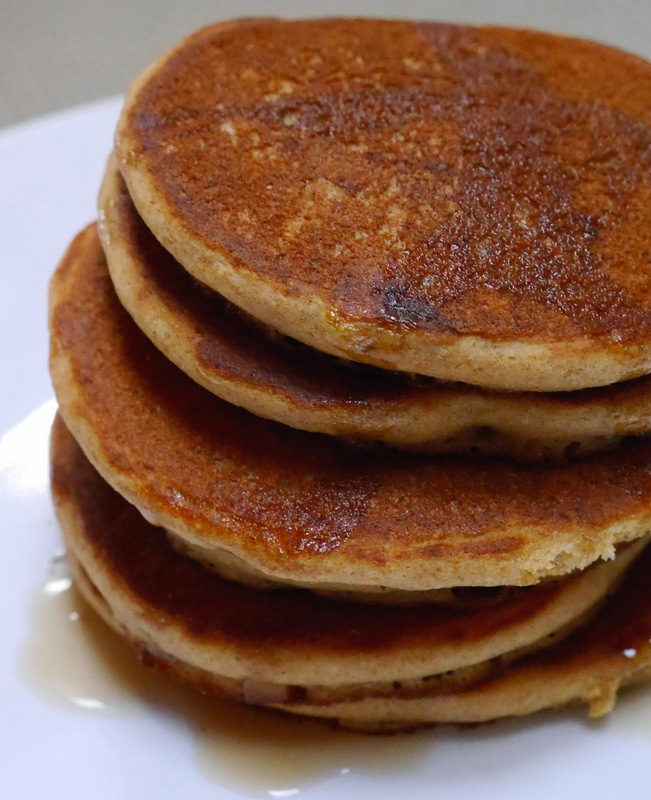 Light and healthy whole wheat pancakes. Check out my eBook, Health Begins in the Kitchen. Pancakes always seem like a special meal to me. Maybe because they are generally served on weekends when we have a bit more time. I used to love making little silver dollar-sized ones when the kids were little. And I'll admit that I occasionally still make the little guys for myself. Pancakes themselves can make a light and healthy meal. But when weighed down with butter on every layer and drowned in sugary syrup, not so much. A great alternative to that is to smother the pancakes in fresh berries and fruit. One of my favorite combinations is raspberries and chopped mangos. Bananas and strawberries or peaches and blueberries also make great toppings - the combinations are endless! A touch of powdered sugar goes a long way and makes a nice presentation. Place one half teaspoon of powdered sugar in a fine mesh strainer and shake over each serving of pancakes. One half teaspoon of powdered sugar only adds 5 calories. Low sugar jam is another good alternative to butter and syrup. Low Sugar Strawberry Jam is delicious on pancakes or French toast. My eBook has an entire chapter dedicated to making healthy jam. But if you do use butter (or a vegan buttery spread) and syrup, use it sparingly. A little will give you the flavor you need. This stack of pancakes has only a single tablespoon of maple syrup over the top. Pancakes also make a great dinner when served with vegan sausage! Place the flour, baking powder, baking soda and salt in a 1-quart pyrex pourable glass container. Stir to combine. Mix the milk, oil, and maple syrup (or agave) in a 1-pint container. Heat a large, lightly oiled griddle on medium heat. Add the milk mixture to the dry ingredients and stir until combined. Pour pancakes onto the griddle using about 1/4 cup for each pancake. Cook until you see bubbles on top, about 3 minutes or so. Flip over. Cook another few minutes until done and brown on both sides. Serve immediately. Top with fruit, low-sugar jam, or syrup. Per serving (pancakes only): 153 calories, 5 g total fat, 0 g saturated fat, 0 mg cholesterol, 4 g protein, 21 g carbohydrates, 3 g dietary fiber, and 597 mg sodium. Homemade whole wheat and semolina saffron noodles. 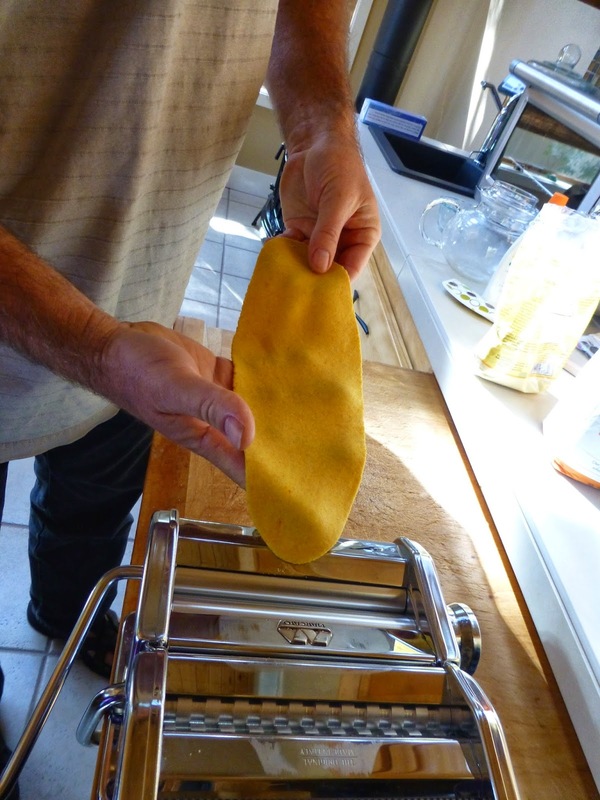 I love the taste and texture of homemade pasta but I never tried making it myself until my son bought me a pasta machine for my birthday. 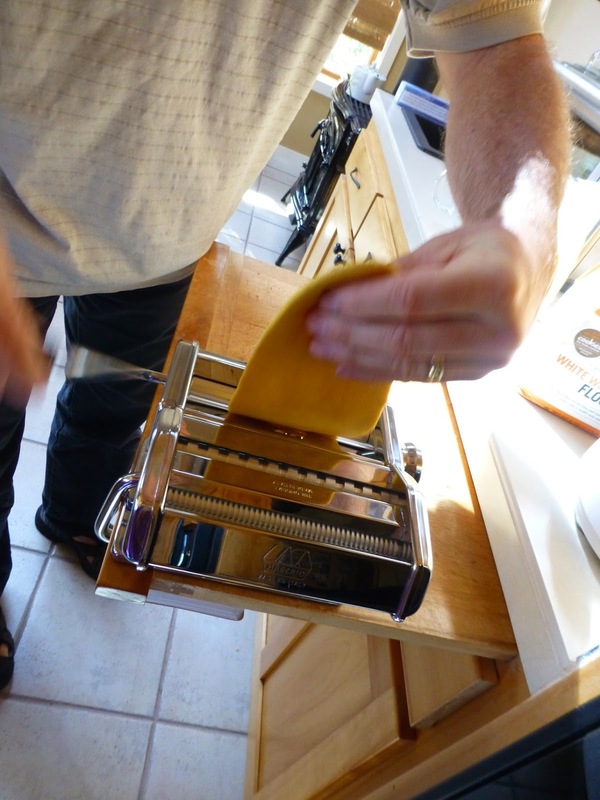 You don't really need one because you can roll out the dough and cut each individual noodle with a knife, but the pasta maker makes the job easier, faster and, more importantly, creates a more consistent noodle. If each noodle is a different thickness and width, which happens when you are doing it by hand, they won't cook evenly. 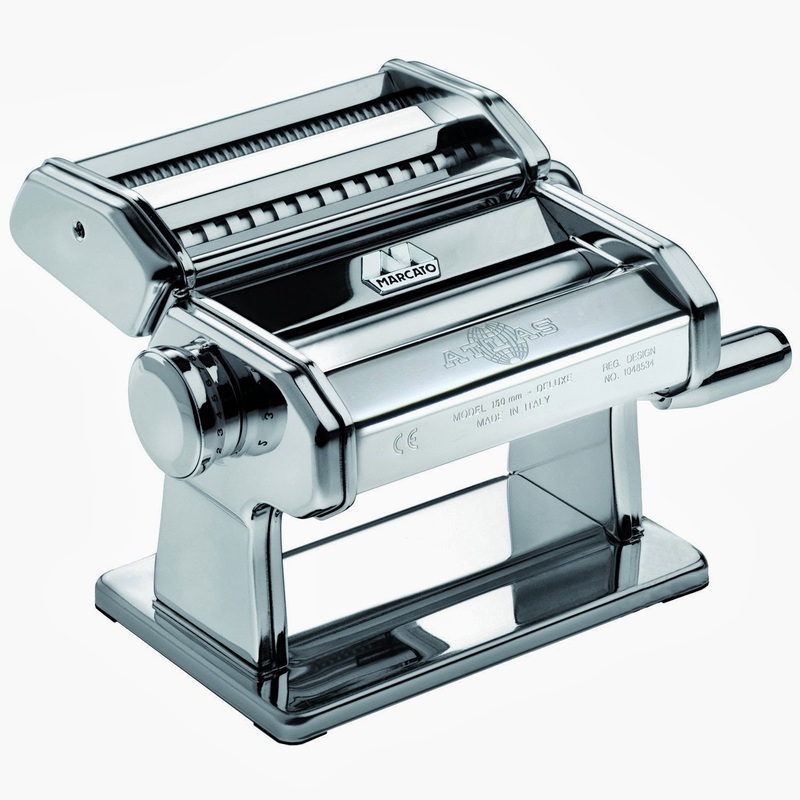 A pasta maker is not only a nice gift, but it's a good investment. Gourmet pasta is now selling for $6.00 or more a pound (kind of crazy since we're just talking water and flour here!). So it pays for itself pretty quickly. The other fun thing about making your own pasta is you can select your ingredients. I like to mix semolina with King Arthur's white whole wheat flour. To make it even more fun, I like adding other things like turmeric to give it some anti-inflammatory, anti-cancer properties. Today I'm going to add saffron to the noodles. I was dying to try matcha green tea powder but Doug wasn't that into it so I will save that for another day. Crush the saffron threads until they are powder. Add boiling water and olive oil. Stir and set aside. Place white whole wheat, semolina flour and salt into a food processor with a dough blade. (I forgot to change the blade and it worked ok with the S-blade, but if you have a dough blade, it's best to use it.) Pulse until the flours and salt are well mixed. 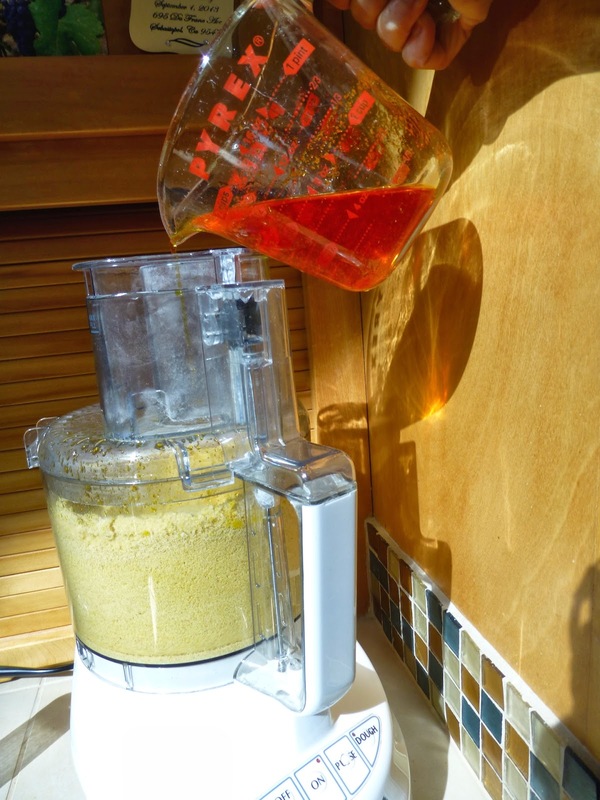 With the food processor on, slowly add the saffron liquid to the flour until it forms a ball. You might have to stop and scrape down the sides. The ball should still be moist but not too sticky. If it's too dry, add more hot water, a tablespoon at a time. It it's too moist, add a touch of flour. Place the dough on a lightly floured surface (pastry mats work really well) and knead until smooth, a few minutes. Roll each into a ball, place on a plate, cover with plastic wrap or a towel and let rest for 20 to 30 minutes. 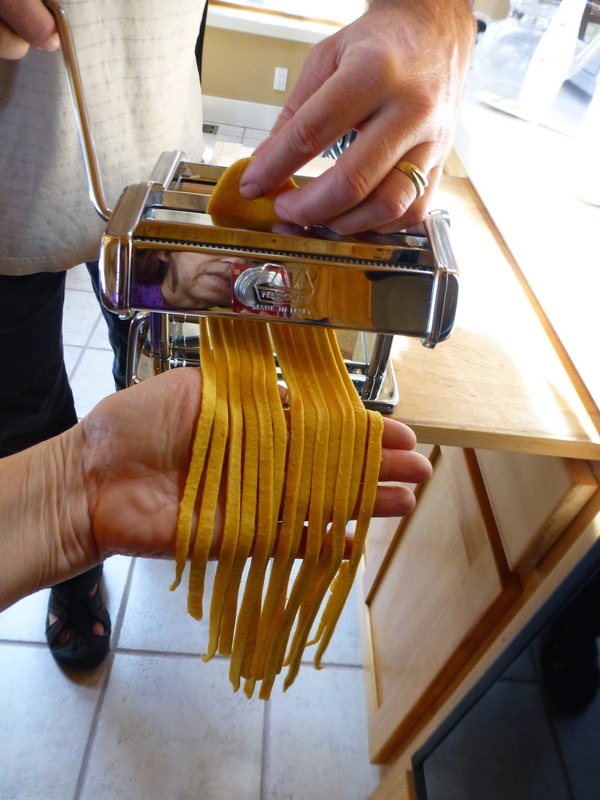 Once rested, you can either roll these out by hand or with a pasta maker. To roll out by hand, place on a lightly floured pastry mat or flat surface and roll out until thin. With a sharp knife, slice into individual noodles. To use a pasta maker, dust each ball of dough with some flour. Roll through the first section of the pasta maker and make a long noodle. Do this twice for delicate, thin noodles. You can use the long noodles as is to make lasagne. To make fettuccine noodles, run them through the next slot set for fettuccine-sized noodles (or set for spaghetti if you want thinner ones.) Have someone there to catch them! You can cook them right away or dry them for cooking later. The first time I did this, I used several coat hangers and hung noodles all over the house. Once I got more serious about making pasta, I bought a pasta drying rack. It's less than $20 and worth the money. Once they dry, if you are not using them right away, place them in a ziplock bag and store in the refrigerator or freezer. To cook, place in a pot of boiling, salted water and cook until they reach the desired texture. The time will vary depending on how long you dried the noodles and how thin they are. Thin fresh noodles can cook in just a few minutes so taste them often. Drain and serve with a sauce, tossed in some veggies, or in a noodle soup. Last night for dinner I served the saffron fettucine with cauliflower and shiitake mushrooms that were sautéed in garlic and oil and cooked, until tender, in veggie broth. I made the rest of the noodles for lunch in a simple veggie broth with carrots, onions, and celery. Perfect For Breakfast, Lunch, Or Dinner! This low-calorie kale bowl is perfect for weight loss! This simple kale bowl makes a great meal. Lately I've been enjoying it for breakfast but it is also wonderful for lunch or dinner. You can use any of your favorite grains as the base. For a gluten-free meal, use quinoa, millet, or rice. If gluten is not an issue, you can also make the dish with barley, farro, or couscous. Or, if you'd like, replace the kale with chard or beet greens. For breakfast I serve it with a small fruit salad and for lunch or dinner I serve it with a tossed green salad or cup of soup. Whatever grain or greens you select, it's a delicious low calorie recipe, with less than 300 calories per serving. When made with kale and protein-rich quinoa, the dish provides 11 grams of complete protein, providing all of the essential amino acids. It also delivers a substantial dose of omega-3 fatty acids. The avocado provides a healthy monounsaturated fat that keeps you full longer. Prepare quinoa. If quinoa is not pre-rinsed, place in a fine mesh strainer and rinse under cold water for several minutes. Place quinoa in a 2-quart sauce pan with 1/4 teaspoon of salt and bring to a boil. Reduce heat and simmer, covered, until all the water is absorbed, about 18 to 20 minutes. Remove from the heat and let rest for another 10 minutes. While the quinoa is cooking, steam the kale until tender, about 10 minutes. Meanwhile, thinly slice the avocado and set aside. To prepare the kale bowl, place one quarter of the cooked quinoa in each of four bowls. I used multi-colored quinoa as the base of this kale bowl. Place one quarter of the steamed kale over the quinoa. Place one quarter of the avocado slices over the kale. Squeeze fresh lemon juice over each bowl and sprinkle each with one quarter of the hemp seeds and a little salt. Serve immediately. Per serving: 277 calories, 10.5 g fat, 1 g saturated fat, 789 mg omega-3 and 3,182 mg omega-6 fatty acids, 0 mg of cholesterol, 11 g protein, 38 g carbohydrates, 7 g dietary fiber, and 179 mg sodium (not counting the final pinch of salt). Looking for additional delicious recipes to help you lose weight, get healthy, and feel great? 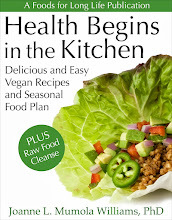 Check out my eBook, Health Begins in the Kitchen available on Amazon and iTunes. for those avoiding wheat. Which one is best? Many people today avoid wheat and other grains that contain gluten. About 1% of Americans have celiac disease and many more suffer from non-celiac gluten sensitivity. For these people, eating even the slightest amount of gluten can have severe consequences. Others may give up gluten temporarily during a cleanse or food-elimation diet just to see if they feel better. Luckily, there are other wonderful grains (and seeds) available to choose from, making gluten-free eating easier than it's ever been. Here are three easy-to-find alternatives and how they stack up nutritionally. Millet is a grass seed, grown mostly in Asia and Africa. Although it is a staple in these countries and has been grown for 10,000 years in East Asia, it has not been a significant crop in the U.S. In fact, the type of millet grown in the U.S. is sold mostly as bird seed. But lately, millet has been popping up on more and more menus as well as food blogs, perhaps driven by the demand for gluten-free cuisine. I must admit, I had never cooked with it before last week so I was excited to try it. The first way I prepared it was as a whole-grain side dish. It has a delicious, nutty flavor. To prepare, mix one cup of dry millet with 2 1/2 cups of water or broth in a 2-quart saucepan with a pinch of salt and a teaspoon of Earth Balance buttery spread. Many of the recipes I've seen use only 2 cups of water but I found that to be too dry. Bring to a boil on high heat. Reduce the heat and cook, covered, at a low simmer until all liquid has been absorbed, about 15 to 20 minutes. Remove from the heat and let rest, covered, for another 10 minutes. Fluff up with a fork and it's ready to serve. Fluff up the cooked millet with a fork and serve. One cup of dry millet yields about 3 1/2 cups of cooked millet. I used some of the cooked millet in a delicious kale bowl that I will blog later this week. But I had a bunch left over. So the next morning, I put the leftover millet in a small saucepan with almond milk, cinnamon, raisins, vanilla, and some sweetener and cooked it until it turned into a wonderful porridge. With these seasonings, it had the taste and texture of rice pudding and made a delicious breakfast. Combine millet, water, 1 cup of almond milk, vanilla, salt, cinnamon, raisins, and Earth Balance in a 2-quart saucepan and bring to a boil. Reduce heat, cover, and simmer undisturbed for 20 minutes. After that, start stirring occasionally and cook, covered, until it reaches the desired porridge-like consistency, another 10 minutes. Add additional milk if it gets too dry or cook uncovered if it is too wet. Stir in some sweetener to taste (a packet of stevia or xylitol) if desired. Divide into two bowls. Top each bowl with a touch of almond milk and a teaspoon of flax oil and serve. Rice is the go-to grain for most people on a gluten-free diet. It's cheap, easy to find, and most of us have eaten it all of our lives. I love the nutty flavor of brown rice and feel much better about eating the more wholesome version of this grain. I must confess, however, I have a weakness for white jasmine or basmati when I'm in a hurry or I'm craving a lighter and creamier texture. Try my recipe for Brown Rice Sushi with Roasted Eggplant, Peppers, and Shiitake Mushrooms. Quinoa is a cereal grain (it's actually a seed) native to South American, that has become extremely popular in U.S. cuisine. It is pretty easy to find and prepare. It comes in white, black, red, or a combination rainbow. If you buy "pre-rinsed" quinoa, you can skip the rinsing step. But if you don't, it's important to place the quinoa in a small mesh strainer and rinse under cold water for a few minutes to remove the soapy tasting saponins on the outer coating. Stir a cup of rinsed quinoa into 2 cups of salted, boiling water or broth. Reduce heat, cover, and simmer until all the water is absorbed, about 18 to 20 minutes. Remove from the heat and let rest, covered, for 10 minutes and serve. 1 cup of dry quinoa yields about 3 cups cooked quinoa. Quinoa has some advantages over rice and millet. It contains more protein and the protein is "complete protein" with the proper balance of all essential amino acids. It also contains the most dietary fiber. 1 cup of cooked quinoa has 222 calories. Try my recipe for Garden Tomatoes Stuffed with Quinoa and Sweet Corn. Although quinoa comes out ahead in certain categories, it's always good to mix it up and eat different grains to get the maximum nutritional benefits. For more recipes and nutritional information, download my eBook, Health Begins in the Kitchen, available on Amazon and iTunes. Why Black Beans Are So Good For You! Black beans are low in fat and high in protein and fiber. Do you love black beans? If so, you're in luck as they are one of the healthiest foods in the world. In one small cup you get over half of your daily recommended amount of dietary fiber and an amount of protein equivalent to 2 ounces of meat (but without the fat and cholesterol.) They help stabilize blood sugar and support your digestive tract as well as a healthy heart. Although I always encourage eating colorful fruits and vegetables to maximize the consumption of phytochemicals, the black coating of this bean is rich in anthocyanin flavonoids. Less than 1 gram of total fat, 0.2 grams of saturated fat, and zero cholesterol. 64% folate - very important during pregnancy! It's also a good source of omega-3 fatty acids, providing 181 mg per 1-cup serving and 217 mg of omega-6 fatty acids giving it a healthy omega-6 to omega-3 ratio of nearly 1:1. 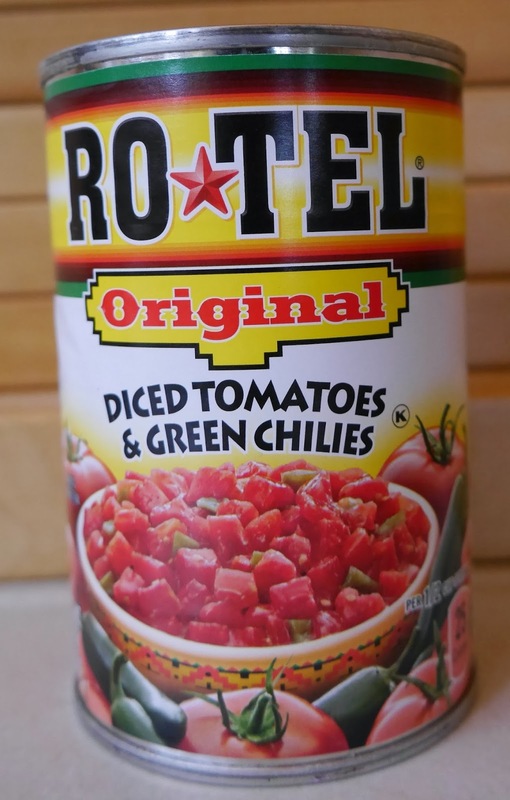 If you want to spice things up, buy some Rotel tomatoes! They are similar to diced tomatoes but contain green chilies and are quite spicy. I love their flavor in soups and chilies and use them in this recipe. If you can't find them in the grocery store, you can order an 8-pack on Amazon. If you enjoy the flavor of Rotel tomatoes, you might also enjoy Spicy Butternut Squash and Red Lentil Dahl with Cauliflower and Whole Grain Pasta. Although plantains look like bananas, they are quite different. Instead of peeling them and eating them as a raw fruit, they are cooked and eaten as a vegetable. They are a staple in Asia, Africa, and Central America, and served like potatoes. dark yellow with spots, not the green ones. Although you have never seen me fry anything, today I am pan frying these plantains in a very small amount of oil in a stick-free pan. Since there is no oil in the black bean soup, I felt that we could splurge a bit to get a nice, crisp plantain. Allow 8 hours (or overnight) to soak the beans and about 3 hours to cook the soup. Make the soup. Pick through the beans to remove any rocks and rinse with cold water in a colander. Place the beans in a large soup pot or 5-quart Dutch oven and cover with enough cold water so that it is at least one or two inches over the beans. Soak overnight. The next day, drain and rinse the beans. Place back in the pot and cover with the vegetable broth, onions, celery, garlic, and pepper. Bring to a boil on high heat. Skim off the foam, reduce heat, and cover. Cook until the beans are soft, about 2 hours, stirring occasionally and adding additional broth if needed. Remove 2 cups of the soup and place in a blender. Return to the pot. Remove some of the soup from the pot. Blend until smooth and return to the pot. Stir in the Rotel tomatoes, cumin, salt, and cilantro and cook, uncovered, until you reach the desired thickness, about 30 minutes or more. Pull the skin away from the plantain carefully and remove. Slice into 3 pieces horizontally and then standing each piece on edge, slice vertically into thin pieces. Heat the oil in a large, non-stick fry pan. Place the sliced plantains in a single layer and cook each side, turning several times, until they soften on the inside but are crispy and golden brown on the outside. Place on a paper towel to remove the excess oil. When the soup reaches the desired thickness, stir in the fresh lime juice and serve garnished with fresh cilantro, diced avocado (optional), and a few pieces of fried plantain. If you'd like, you can serve it over rice. Per serving of soup: 319 calories, 1.3 g total fat, 0.3 g saturated fat, 213 mg omega-3 and 342 mg omega-6 fatty acids, 0 mg cholesterol, 17 g protein, 56 g carbohydrates, 13 g dietary fiber, and 390 mg sodium. Per serving of plantain (assuming 1/2 of the oil is absorbed): 46 calories, 1 g total fat, 0 g saturated fat, 16 mg omega-3 and 123 mg omega-6 fatty acids, 0 mg cholesterol, 0 g protein, 10 g carbohydrates, 1g dietary fiber, and 1 mg sodium. If you've enjoyed this recipe, you can download my eBook, Health Begins in the Kitchen, available on Amazon and iTunes.